Bahá'í House of Worship at New Delhi is part of the Tentative list of India in order to qualify for inclusion in the World Heritage List. 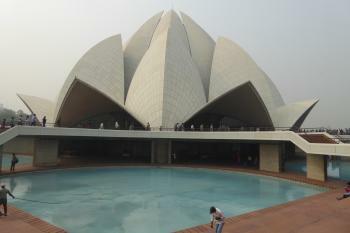 The Lotus temple in New Delhi is a Bahai temple built in modern style - something special in a land where almost all places of worship are built in a traditional style. The design of the temple is quite pleasing and sure looks good on photos, however actually visiting the place can be a bit underwhelming. Firstly, visiting takes a bit of effort - you can't just walk in. Arriving is the easiest part - you can take the Delhi metro to get near and then walk the rest (or take the inescapable tuk-tuk). You then have to wait in a long queue - there are a lot of other tourists (mainly indians) who want to visit the temple. Don't take any bottles with you (even empty ones) - they throw them away, then send you back to the end of the queue. After entering, you have to deposit your shoes at a busy storage station and walk through the gardens without them, all while being pushed around in a long stampede of visitors. The gardens are well-kept, but offer nothing special. The view of the main building could be great if the Delhi smog does not spoil it - you are still within the city's dust dome. You can't enter the temple itself, but you can peek inside and see that it is almost completely empty - no lavish treasure, statues or decorations in this temple. You will not learn much about the Bahai faith, and don't expect any spiritual experiences. Maybe I am a bit harsh on the site here. It is a imposing building, however for the european eyes it looks too similar to any modernist multi-purpose hall, and it doesn't offer the exotic flair you expect from an indian temple. I fail to see the WHS potential - the Bahai faith is already well represented with its very own WHS, and there are a lot of modernist buildings that can offer similar architectural merits.